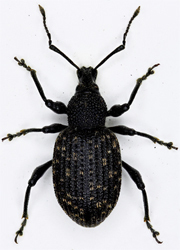 A large family with more than 400 British species. 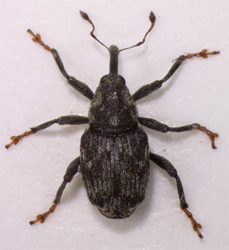 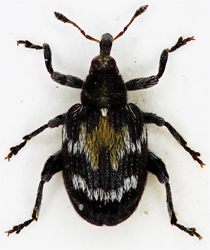 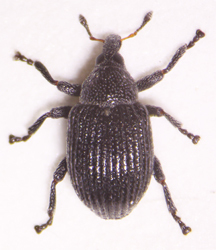 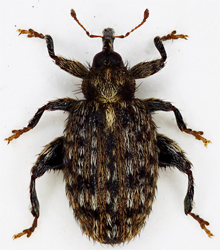 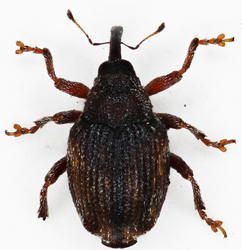 With the exception of the Scolytinae these species are known as weevils. 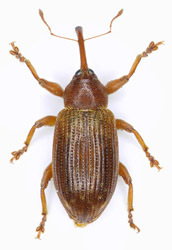 Historically the family has undergone many nomenclature changes and shufflings and as research continues it seems as though the group is nowadays more fluid than ever. 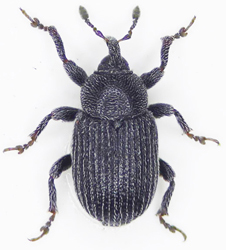 For a brief insight into the problematic nature of curculionid nomenclature one should read the introduction to Morris' 2002 handbook. 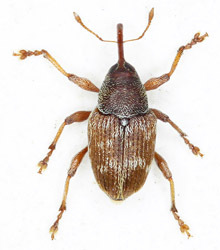 This is frustrating for the non-specialist because it becomes ever more difficult to keep up with and to appreciate and understand the various groups. 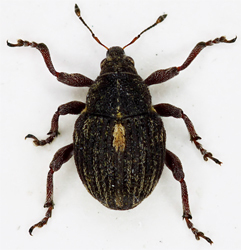 For the purpose of listing and describing local fauna such matters need not concern the naturalist, here all we need is the ability to find specimens and identify them. 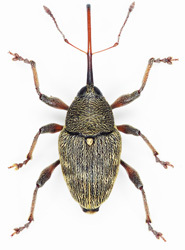 But matters of nomenclature etc will concern the amateur coleopterist because the amateur coleopterist is interested in beetles per se as well as in the local fauna. 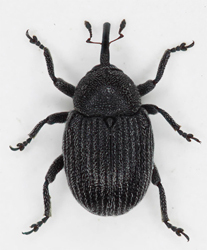 This website is concerned with all aspects of coleoptera because its creators are passionate about such things and for this reason we will attempt to describe and illustrate the subfamilies in more detail than is needed for a purely practical approach. 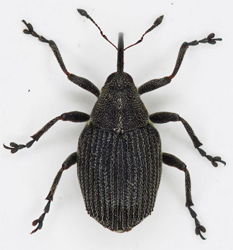 Becoming familiar with the weevils is a formidable task which demands lots of time, work and, to be frank, a passion for the group. 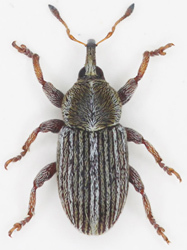 The keys in Joy's handbook while (obviously) lacking the various species and groups added since its creation, and while (blatantly) pushing its luck with many groups remains useful and on the whole simple to use, Furthermore, because of the number and density of the line drawings it may be useful when starting ot to simply compare a specimen with the drawings page after page until something sensible is found, going back to the keys afterwards can be very instructive. 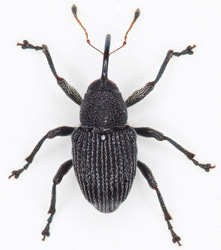 Weevils also tend to be well represented in general guides to beetles and there are several internet sites (other than this one) that feature enough species well enough to allow a broad familiarity with the group before on the RES handbooks by Morris which so far (2008) cover well over half our species. 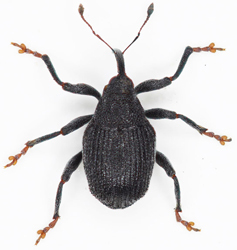 These handbooks are not particularly difficult to use but they are technical and thorough and so some broad familiarity with the group will be a great advantage. 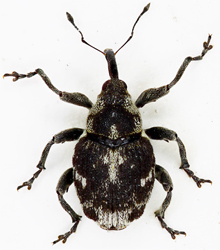 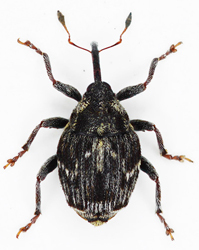 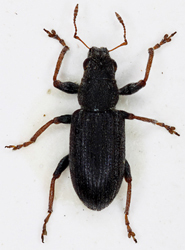 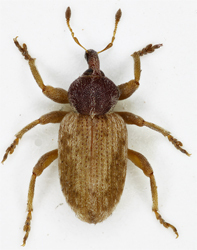 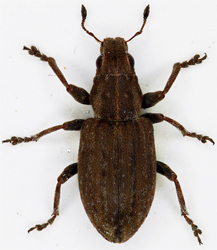 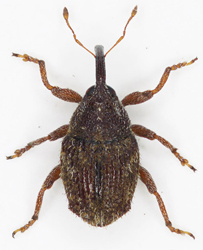 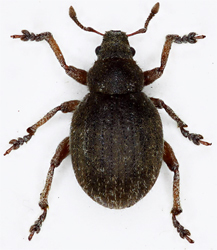 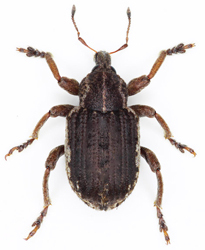 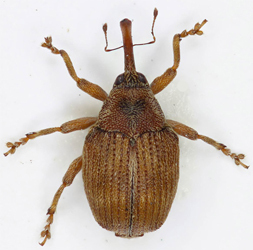 From our pictures it is obvious that weevils are a very characteristic group which, with the exception of several species of the Heteromeran Salpingidae, will not be confused with any other. 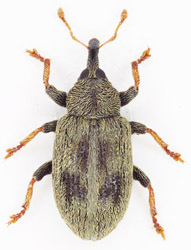 The Scolytinae are atypical in being cylindrical and having no rostrum and small species may be taken for Bostrychidae or Ciidae but they share two basic curculionid features; geniculate antennae and broadly bilobed third tarsal segments. 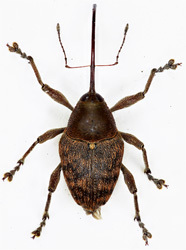 Histeridae feature this type of antennae but possess very different tarsi. 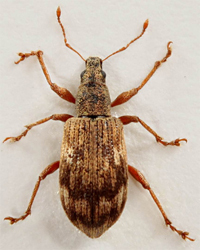 With a little practice and experience the curculionid antennae are immediately recognisable. 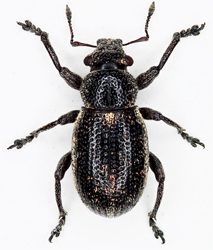 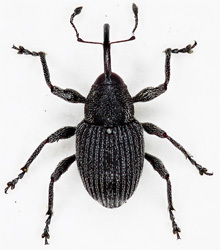 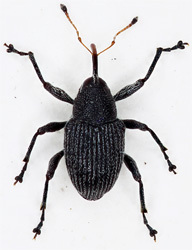 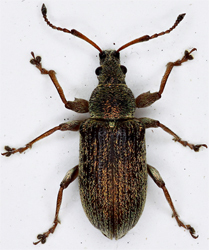 There are several other families of weevils found in Britain, all of which are distinct and readily separated from the Curculionidae as follows:Possession of geniculate antennae with a compact club will exclude Anthribidae, Attelabidae, Urodontidae, Apionidae and the eyeless raymondionymidae. 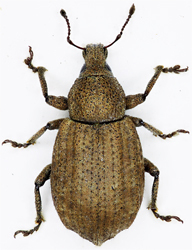 With two basal abdominal sternites connate (fused), elytra striate excludes Nemonychidae. 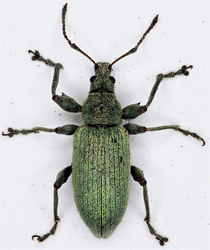 With short trochanters excludes Nanophyidae (2 very distinct species). 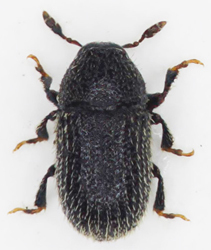 Curculionidae (excluding Scolytinae) 1.5-5mm Head without neck. 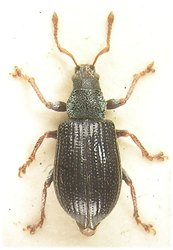 Antennae clubbed and geniculate, scape longer than next 2 segments, with well developed rostrum, sometimes broad and short (Entiminae). 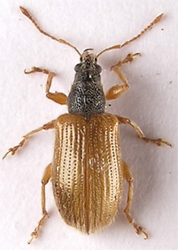 Elytra covering abdomen, usually broader than pronotum. 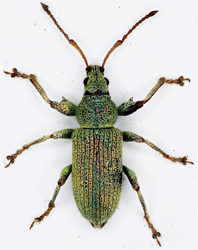 Many species with scales and/or pubescence dorsally and/or laterally. 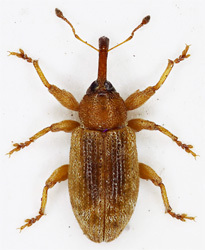 Underside variously grooved or excavate to receive appendages. 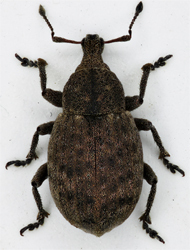 Tarsi pseudotetramerous, 3rd segment usually strongly bilobed. 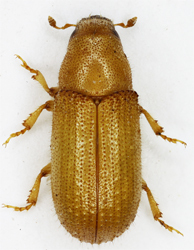 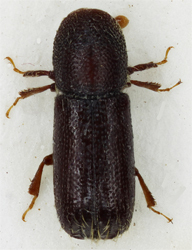 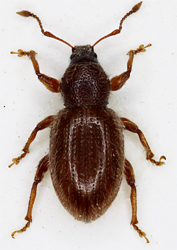 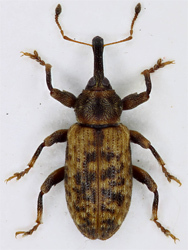 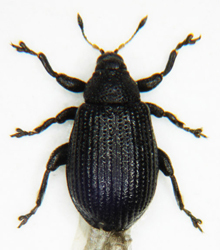 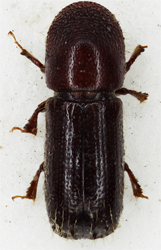 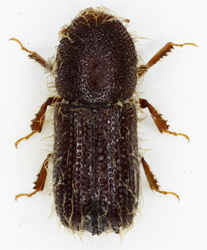 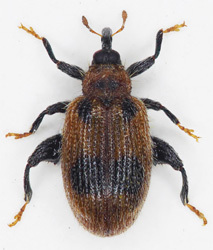 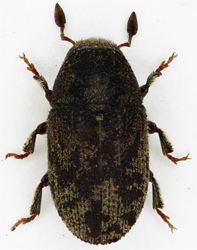 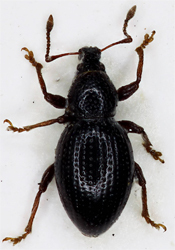 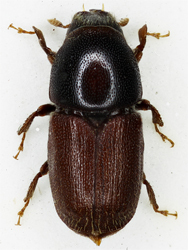 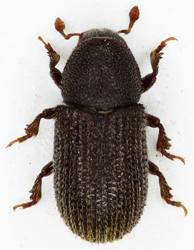 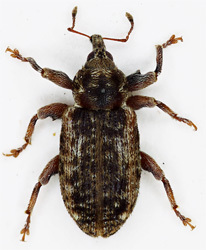 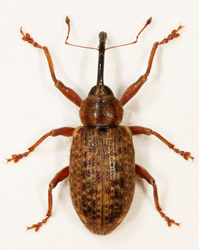 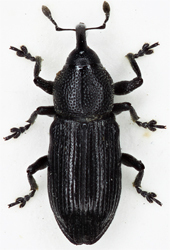 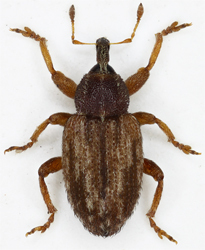 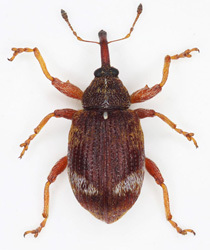 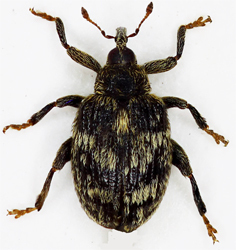 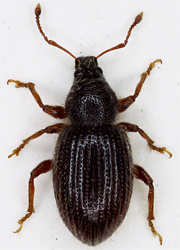 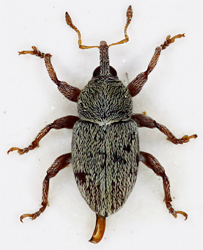 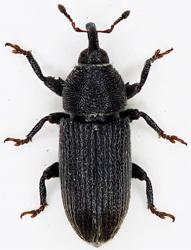 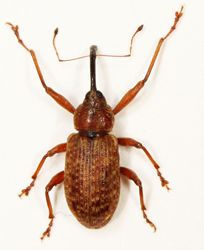 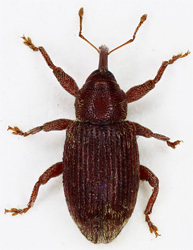 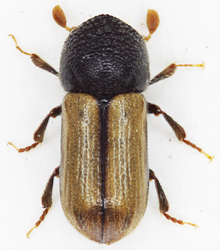 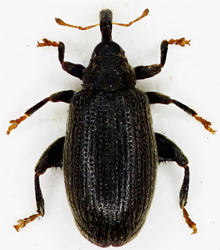 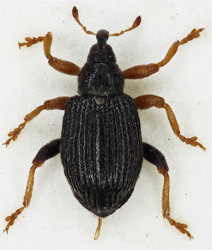 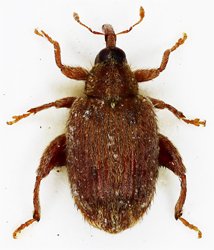 Curculionidae (Scolytinae). 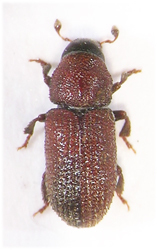 1.2-6mm Near cylindrical and heavily sclerotised species, mostly wood borers. 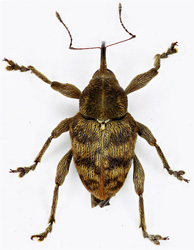 Antennae with less than 8 segments, geniculate and with well develoed club. 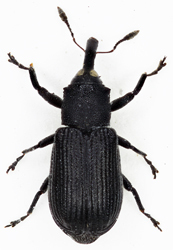 Elytra sometimes excavate behind. 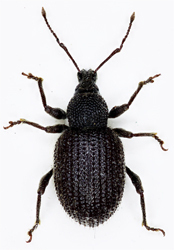 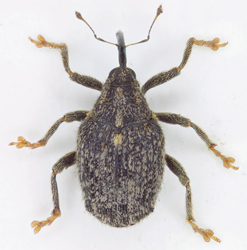 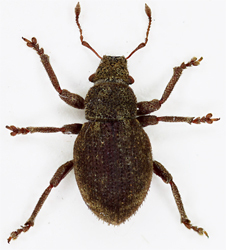 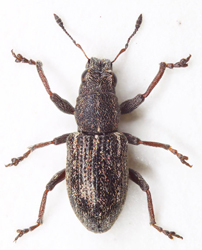 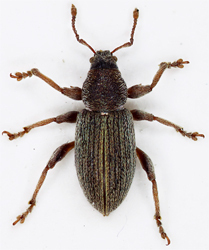 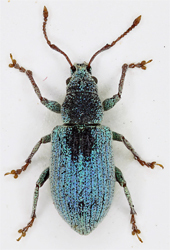 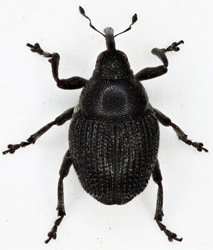 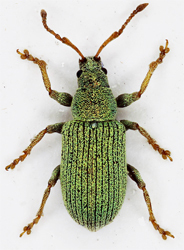 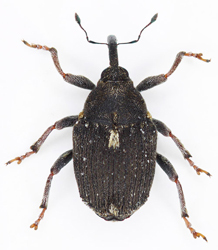 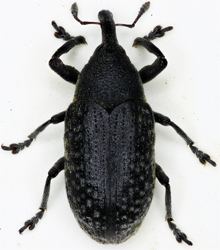 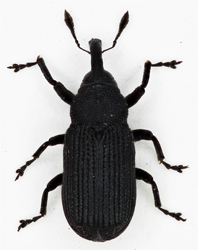 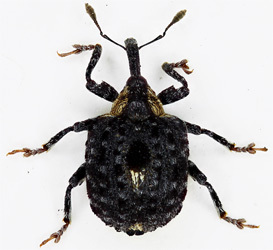 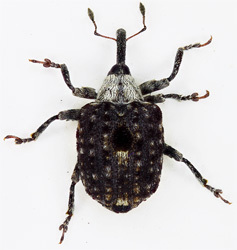 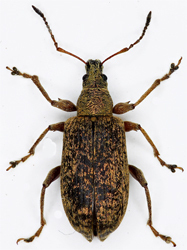 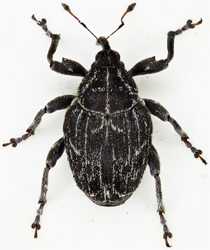 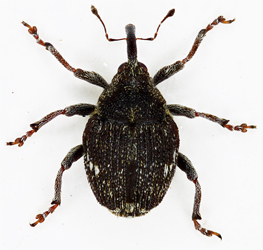 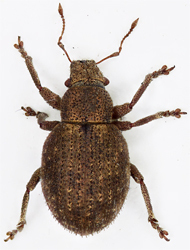 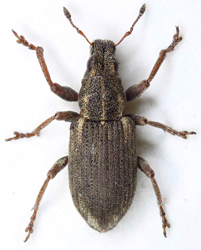 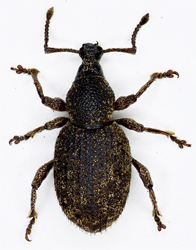 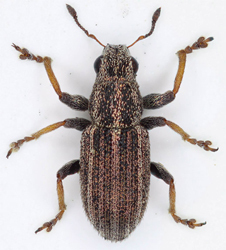 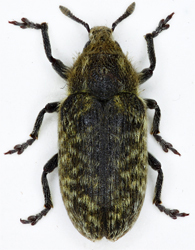 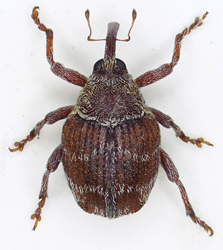 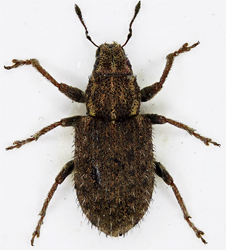 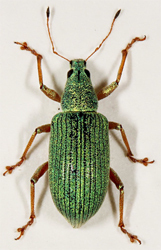 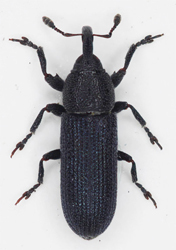 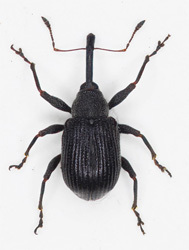 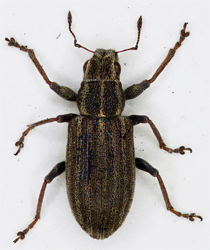 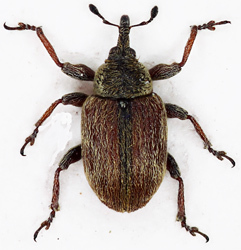 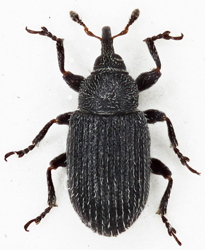 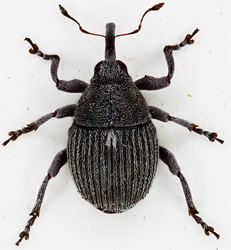 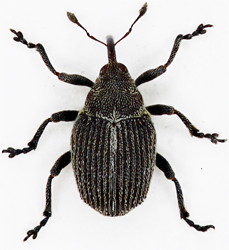 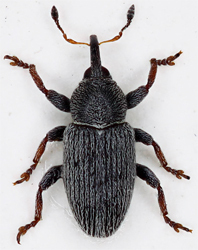 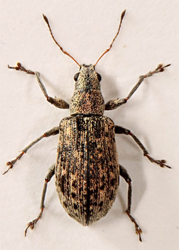 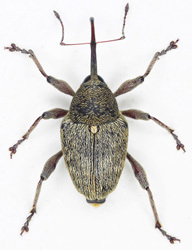 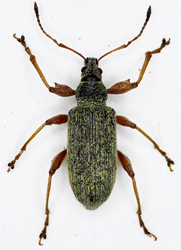 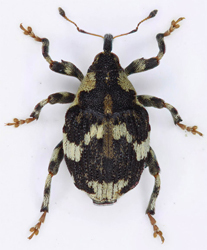 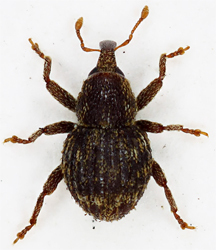 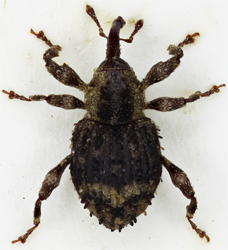 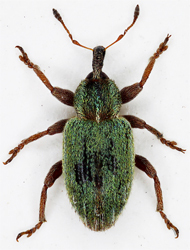 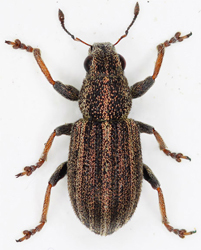 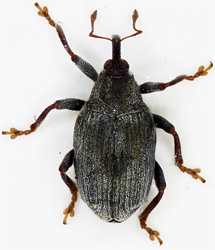 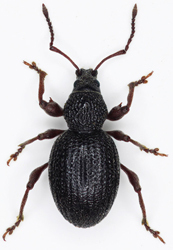 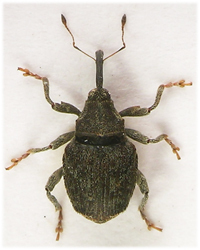 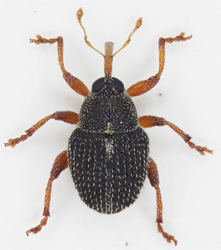 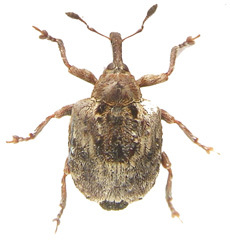 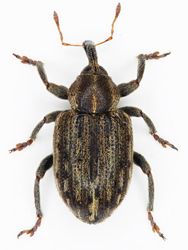 Weevils feed on various parts of plants including leaves, flowers, seeds, wood and roots and most species are restricted to a narrow range of hosts while many are monophagus. 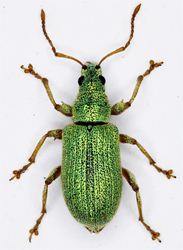 Morris gives comprehensive lists of host plants and feeding sites for the species dealt with so far in the RES handbooks. 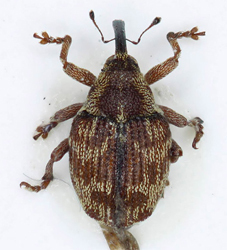 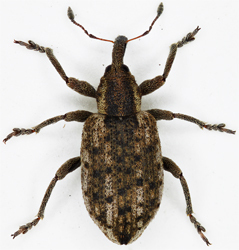 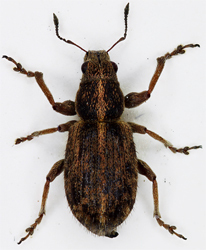 Knowing which species of plant a weevil is associated with can thus be a powerful aid to identification. 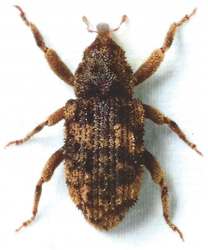 As we describe the local fauna we will cover such things as hosts and seasonal occurence so that interested parties will stand a good chance of observing them in the wild. 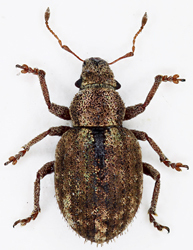 Trying to provide a family overview with only our local material for reference is difficult and would mean leaving out several interesting groups, so, whether we have a species or not, we will describe all the groups of British weevils. 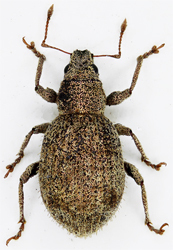 The largest subfamily including most peoples archetypal weevil. 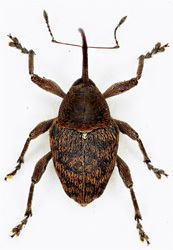 With 108 species divided into 26 genera in 11 tribes. 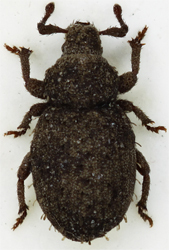 1 genus (Bagous) with 21, mostly rare, semi aquatic, species. 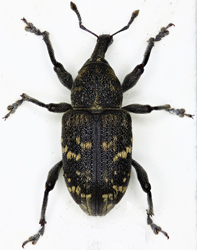 5 genera with 7 species. 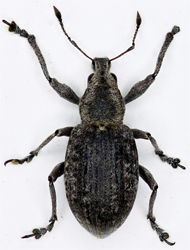 29 genera with 92 species. 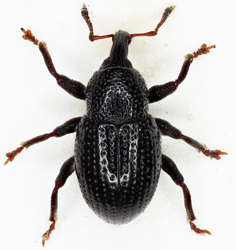 11 genera with 15 species. 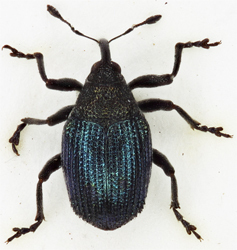 3 genera with 5 species. 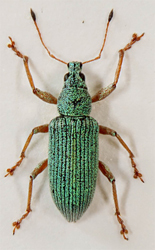 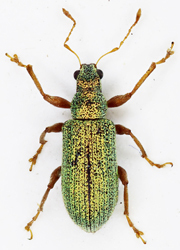 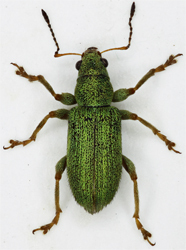 1 genus (Gronops) with 2 species. 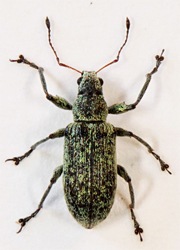 21 genera with 109 species. 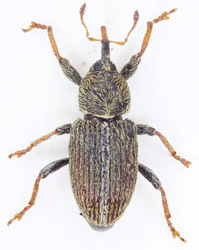 Characterised by their short rostri. 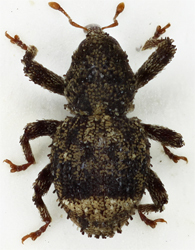 2 genera (Hypera and Limobius) with 18 species. 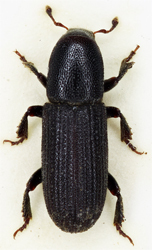 6 genera with 11 species. 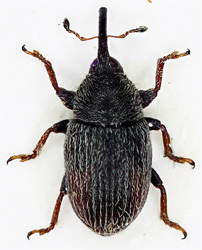 1 genus (Magdalis) with 8 species. 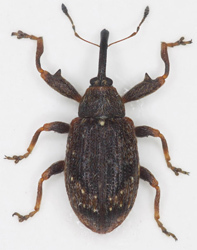 9 genera with 15 species.